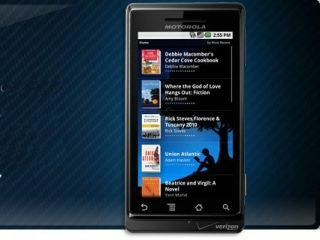 Microsoft today announced that an Amazon Kindle app will launch for its new Windows Phone 7 mobile operating system later this year. The Kindle application, which is already available for iPhone, iPad, Android and BlackBerry will enter the fray for WP7 giving the platform its first dedicated e-book reader app. It'll bring access to 725,000 titles, personalised recommendations to the app's homescreen, automatic back-up of your purchases and the option of sharing all of your books with other compatible devices. The app was demonstrated at Microsoft's Professional Developers Conference in Redmond. WP7 users can sign up to download the app when it becomes available at the Kindle for Windows Phone site. Also unleashed today was a new test version of Internet Explorer 9, while CEO Steve Ballmer spoke of upcoming improvements to the Microsoft Azure cloud computing service. "The cloud is a backplane on which to program and rapidly deploy applications. These are powerful new platforms," he told the audience.